As of May 15th, 2012 DTA has received its NYC DOB Registration # 000116 becoming one of the first registered Class I and Class II Special Inspection Agencies in NYC. On April 13th 2012 Mayor Bloomberg has signed an amendment to 1RCNY 101-06 - Special Rule of the City of New York pertaining to the Special Inspection Agencies, which was enforced on May 13th 2012. According to 1RCNY 101-06, it is now required that Special Inspection Agencies register with the NYC Department of Buildings to perform the Code required inspections in NYC. 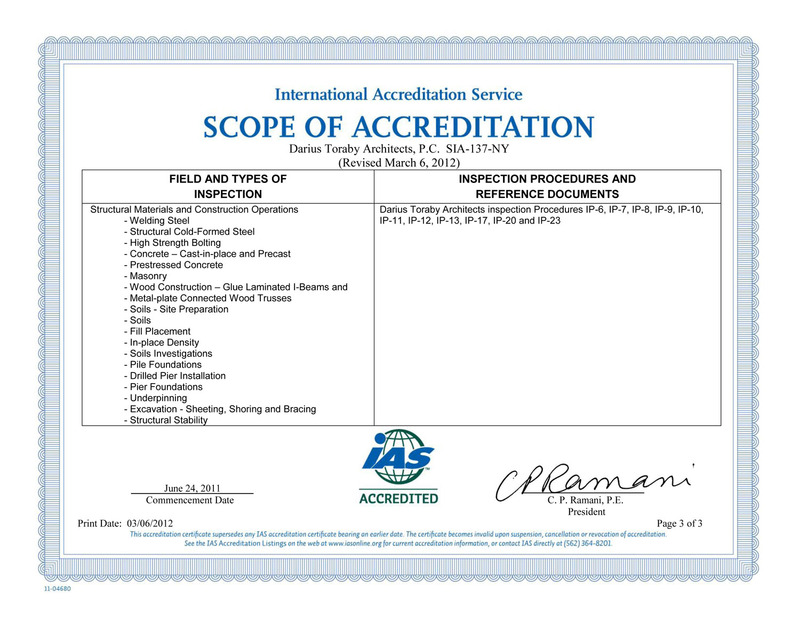 An Agency registered as a Class I Special Inspection Agency for a special inspection category will be permitted to perform the work associated with such special inspection category on any project and it has to be Accredited by the International Accreditation Service (IAS) or an equivalent accreditation agency accrediting to ASTM E329-07. 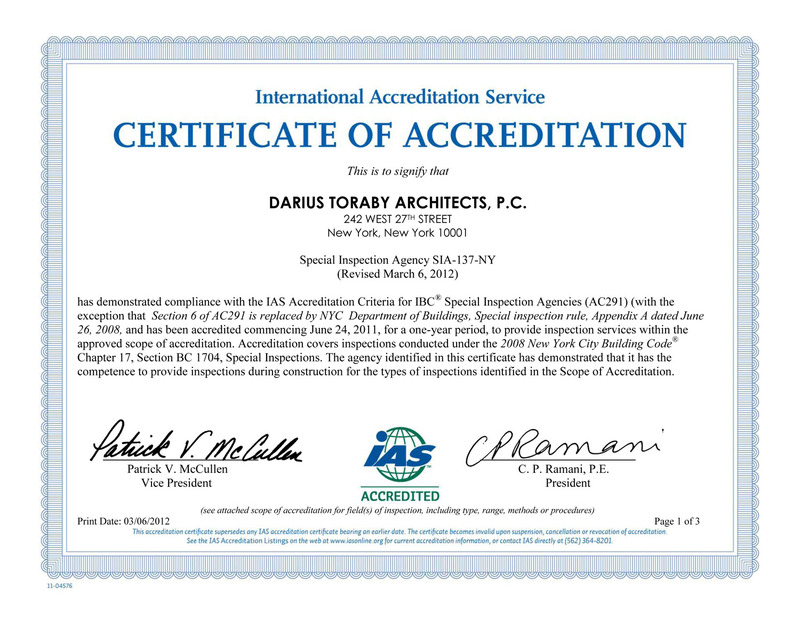 DTA is one of the first Special Inspection Agencies in NYC to receive the IAS Accreditation in July 2010 demonstrating a high level of professionalism, meeting the NYC's requirements of the quality compliance program. The NYC Construction Codes designate third parties as Approved Agencies to perform tests or inspections of materials, equipment, construction related activities, and periodic maintenance. Approved Agencies must meet the qualifications of the Rules of the Department and should be regularly engaged in conducting tests or furnishing inspection services. standards through the listing period. These agencies are qualified to conduct periodic, unannounced, follow-up factory inspections. Inspection agencies will also have the authority to label products according to ISO guide 65. 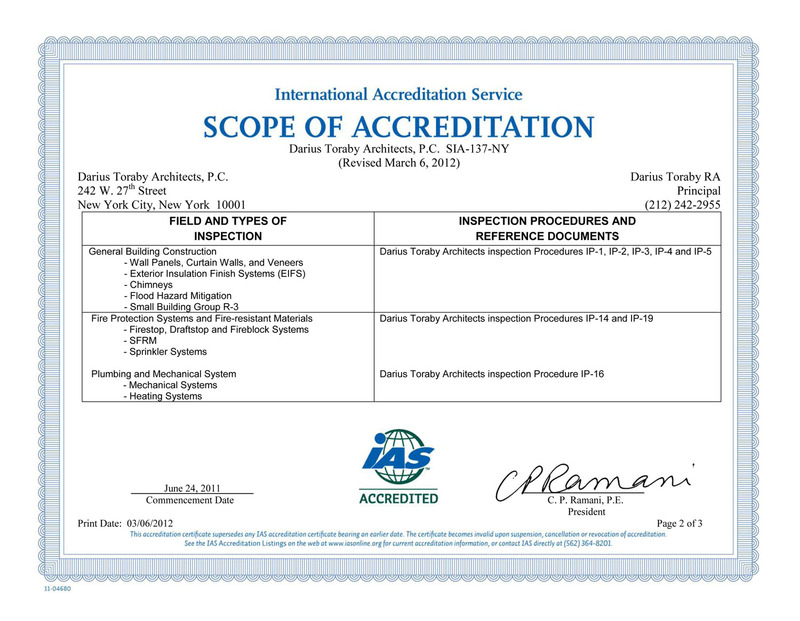 Inspection Agencies operating after July 1, 2008, must be accredited by the International Accreditation Service (IAS), or equivalent accreditation.